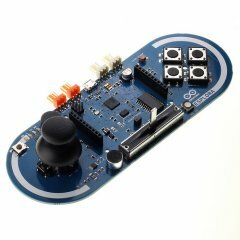 The Arduino Esplora is a fun microcontroller board derived from the Arduino Leonardo. The Esplora is unique because it provides a number of built-in, ready-to-use setof onboard sensors for interaction. The Esplora has onboard sound and light outputs, and several input sensors, including a joystick, a slider, a temperature sensor, an accelerometer, a microphone, and a light sensor. You can expand its capabilities with two Tinkerkit input and output connectors, and a socket for a color TFT LCD screen. Like the Leonardo, the Esplora uses an Atmega32U4 AVR microcontroller with 16 MHz crystal oscillator and a micro USB connection capable of acting as a USB client device, like a mouse or a keyboard. In the upper left corner of the board there is a reset push button, that you can use to restart the board. The board contains everything needed to support the microcontroller: simply connect it to a computer with a USB cable to get started with its built-in USB communication; it can appear to a connected computer as a mouse or keyboard, in addition to a virtual (CDC) serial / COM port.For a step-by-step introduction to the Esplora, check out the Getting Started with Esplora guide.